Almond flour is an excellent protein source, high in dietary fiber, calcium, copper, vitamin E, riboflavin, magnesium and zinc. If you want your diet free of grains or gluten it is important for you to select nutritionally dense natural foods such as almond flour. Some gluten-free flour options such as rice flour, potato starch and tapioca flour are nutritionally weaker than almond flour. Almond flour makes wonderful biscuits and scones. A great option when using almond flour is to go for dairy-free, gluten-free and soy-free biscuits which are delicious in flavor and easy to bake. 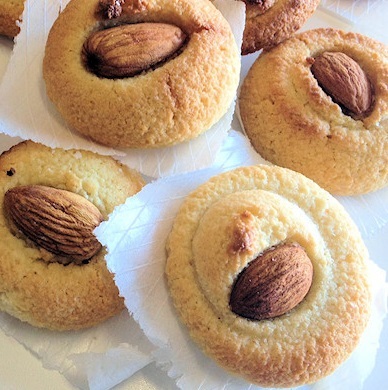 Almond biscuits can also be topped with organic butter, homemade jams or raw honey. Yum! If you have not tried biscuits made with almond flour, you have missed a delicious treat. So go ahead and make some scrummy almond flour biscuits at home today! Mix almond flour, salt, baking powder and baking soda in a bowl. Whisk honey and melted butter in another bowl until you have a smooth paste. Add to this paste buttermilk and eggs, whisk until it is combined well. Combine wet and dry mixture well. Get your oven pre-heated to 180 degrees C. Scoop large tablespoons of almond flour batter into the palm of your hans and roll into balls, about the size of a plum. Place dough balls on a baking sheet and flatten them gently with your palm or fork. Add an almond to the top of each for added flavour and look. To reduce crumbling the dough balls can be placed in a freezer for about ten minutes prior to baking. Cook for 15 minutes or until golden brown.